L'Emancipation à La Réunion by Alphonse Garreau. Wikimedia Commons. Une version étendue de l'article a aussi été publiée en français. Slavery and related forms of servitude have been illegal for some time, but are nonetheless reported to be globally on the increase. It is not easy to make direct or straightforward comparisons between the problems of today and the transatlantic slave trade of the sixteenth to nineteenth centuries. Such an exercise too often ends up in anachronism and errors of interpretation. What we can do, however, is reflect upon differences and similarities between patterns of political activism. In order to better understand today’s patterns we need to relate them to the long-term historical context of antislavery movements born in the eighteenth and nineteenth centuries, from which the international organisations and non-governmental organisations of the twentieth century originate. Instead of celebrating the past, we need to reflect on how and why slavery came to an end as a legal institution, the important yet too often neglected role of slaves and ex-slaves, and the practical limitations of what could ultimately be accomplished from European metropoles. Many stories told about the history of anti-slavery lack both context and critical distance. In France, for example, the abolition of slavery in 1848 continues to be widely attributed to the actions of one man, Victor Schœlcher. This singular focus collapses a complex historical moment into a simplistic story about the power of individual perseverance and commitment. In addition, there have been relatively few comparative studies of past anti-slavery movements. European nations and the United States continue to view their own anti-slavery movements as primarily national projects. This has resulted in a failure to recognise the numerous ways in which developments in different parts of the Atlantic, notably in Europe and the Caribbean-American sphere, greatly influenced one another. Even more importantly, there has been little to no recognition of the role played by the slaves themselves in ending legal legal slavery. Today’s politicians and activists rarely have anything to say about the impact of slave rebellions and the permanent social tension that existed in the colonies due to the struggle over abolition. What is more, the key events that led to the suppression of slavery frequently took place in contexts of war and conflict. 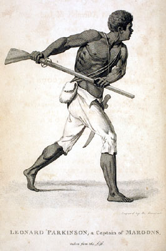 Such was the case in French Santo Domingo/Haïti between 1791-1793 and 1803, in the French colonies at the time of the 1848 Revolution, in the Danish West Indies in the same year, in the British colonies following the Great Jamaican Slave Revolt of 1831-1832, in several Spanish colonies in South America and then in Cuba during the Ten Years’ War, as well as in the United States. “Leonard Parkinson, a captain of Maroons, taken from the Life” by H. Smith. Extracted from Bryan Edwards, Jamaica Assembly, The Proceedings of the Governor and Assembly in regard to the Maroon Negroes, London, 1796. Public Domain. The slave experience has too often been silenced, especially in France. In contrast to the British and Spanish colonies or the United States, no slave testimony exists for the French colonies from the periods of slavery and abolition or afterwards. In addition to this silence, the monumental corpus of documents attesting to Western abolitionism contains gaps and inaccuracies. These gaps are particularly evident when it comes to the abolitionists’ reactions to the actions of slaves themselves. Slaves’ constant calls for change, as represented by acts of resistance, were no less intense in the nineteenth century than they were in previous centuries. What use was made by the abolitionists of real testimony of the realities of the system of slavery and the survival strategies of the slaves? What doubts did they have in terms of the information to which they had access in Europe? No abolitionist of the nineteenth century questioned the principle of colonial expansion itself, or the subjugation of the people of colonised territories. 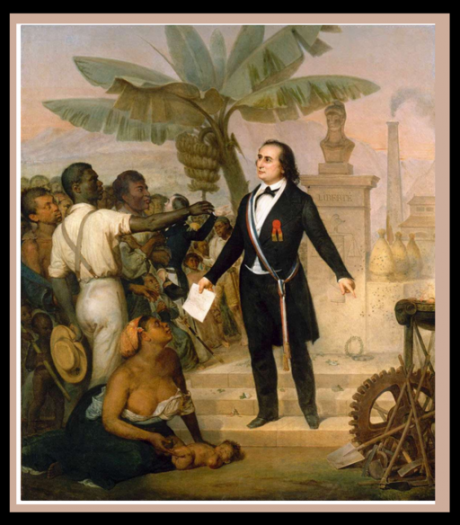 French social reformers, often called utopians, were relatively silent on the subject of slavery and colonisation. They believed that a reorganisation of society would put an end, there and elsewhere, to social injustice. Significantly, such reformers frequently assumed that the colonisation of new peoples would bring about social progress for those who were colonised. The majority of abolitionists in Europe were positioned outside the colonies and had little understanding of—or direct experience with—the social structures established between master and slave in otherwise unfamiliar colonial territories. Their response to any issue of a financial nature was furthermore almost inevitably weak and defensive. In the French case, economic analyses were poorly developed, vague and untested, despite abolitionists’ stated interest in issues of commerce, maritime trade, and property rights. While Schœlcher did produce comparative tables of colonial economies with and without slavery, his calculations remained theoretical and lacked a solid empirical foundation. French abolitionists believed that their proposed methods of abolition would maintain production rates, exports levels, and sugar prices. They would further safeguard private property rights and the interests of the merchant fleet while attracting new investment to the colonies. This position indirectly served the interests of the plantation owners and shippers by leading to protracted parliamentary deliberations. In addition, certain anti-slavery advocates were guilty of harbouring the same prejudices as plantation owners vis-à-vis slaves. Many of them believed that slaves were ill-adapted to life after slavery and to work after emancipation. What is more, they rarely ventured into the domain of diplomacy in which the majority were poorly versed. Their main lines of argumentation were moral, religious and humanitarian in nature: strong arguments to be sure, but insufficient in the face of the private and national economic interests in play. Other important forces to consider are the Société des Amis des Noirs founded in Paris at the end of the eighteenth century, the Comité abolitionniste de la Société de la Morale Chrétienne (1822) and the Société française pour l’abolition de l’esclavage (1834). These were based on British models and are among the first organisations founded in France to fight a specific social or political cause. These organisations might have been a real force had they achieved the cohesion and popular support necessary to act collectively against successive governments. Guillaume de Felice commented on the ineffectiveness of these organisations in his 1846 Appeal to the abolitionists: “Either the abolitionists do not understand the importance of the words they pronounce, or they have very good reasons to see the crime of slavery prolonged, or they do not feel personally invested in the matter.” He restates the urgency of “establishing the absolute criminality of colonial slavery”, concluding as follows “The thing I fear most is not opposition to my ideas: it is indifference and inaction.” (Cf. Guillaume de Felice Émancipation immediate et complete des esclaves, appel aux abolitionnistes, Paris, Delay). The Declaration of the Abolition of Slavery, signed in Paris in April 1848 and based on the proposal of the Commission for the Abolition of Slavery (presided by Victor Schœlcher), was accompanied by a number of other decrees. These instituted a group of so-called republican rights and freedoms, such as universal male suffrage for electing representatives to the National Assembly. The general commissars of the Republic had instructions to “complete, in the name of the Republic, this great act of reparation” for “a crime of inhumanity”. However, some weeks after the proclamation of abolition, a new phase of colonisation and social control was implemented. This new regime was represented by words like order, work, family, forgetting the past, social reconciliation and recognition of the Emancipatory Republic. A number of political trials presided by war councils sent dozens of people judged as ‘dangerous’ to the penal colonies, while a series of arrests by the so-called ‘work police’ regulated the smallest details of the lives, work and movement of the ‘newly free’. A number of methods of social control were put in place which Schœlcher, by this stage removed from power, was able to describe as “attacks on individual liberty”. From 1848 onwards the distance between the ideas expressed in the abolition decrees and the realities on the ground was immense. Continuing discrimination, bolstered by a sense that the past had been left behind, allowed the colonial system to survive. The policy of “forgetting the past” generated myths which profoundly affected the writing of the past and its commemoration. Several commemorations in the twentieth century consecrated the manipulation of the past, which responded to the economic needs of some and to the needs of others for colonial pageantry. Today the struggle against modern slavery takes the form of a dazzling list of moral arguments against slavery as opposed to a treatment of the economic forces in play. Those struggling against modern slavery seem no less up to the challenge than the abolitionists of the past. The multiple facets of servitude clearly illustrate the inefficacy of principles against the constraints of international economic relations, a problem exacerbated by the palpable indifference of the worldwide public.